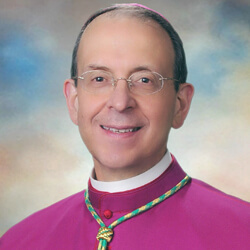 Archbishop William E. Lori released on Ash Wednesday his second pastoral letter, “The Enduring Power of Dr. Martin Luther King Jr.’s Principles of Nonviolence.” He sat down for an extensive interview about the letter with Beverly Burke, media consultant and former TV news anchor. His column this month features excerpts from that interview. Why did you decide to write this pastoral letter? First of all, it was hard not to notice that our society all around us – including this beloved city of Baltimore – was becoming more divided and more violent at times. And that even when there wasn’t physical violence, there is this tendency to approach one another with both violent words and with abusive words, and with a lack of understanding, empathy, a desire to meet somewhere in the middle. … That’s kind of a broader societal thing that I think we’re living through right now. The second thing was, ever since I’ve been here it’s hard to miss the fact that there are so many social ills in our city, that so many people are living in these kinds of conditions. Lots of times, no one is building a bridge, and it’s a bridge that must go both ways. A third thing that prompted me to write it was, of course, the approach of the 50th anniversary of the assassination of Dr. Martin Luther King. I thought to myself, in this situation in which we find ourselves, are not his teachings, are not his principles, as valid as they were 50 or 60 years ago? And the answer I came up with was, yes. It’s time for us to revisit them. When you think of Dr. King’s teaching on nonviolent direct action, is that necessary today? Oh, I would say so. I think there’s two aspects to Dr. King’s teaching. For one thing his principles are aimed at the heart. In other words, the heart has to be converted. … The heart has to be introspective enough to ask wherein racist attitudes are to be found, where the heart is not open to the other. … I think these principles cause us to ask ourselves important questions. … The principles apply to everybody, but they apply to you, where you are. They apply to me, where I am. And unless there is a change of heart with a critical mass of people, it’s difficult to imagine society itself changing constructively. What is the church going to do with the teachings of Dr. King? Then there are discussion questions in the pastoral. These are meant for people – families, parish groups, pastoral councils – to get together and to pray about these principles, reflect on them and to answer these kinds of questions reflectively. … I also put in a web page where people can share their suggestions and their comments. … But this should also lead us as an archdiocese to an examination of conscience, and to ask if there aren’t things we ought to be doing differently. … It’s not just a letter; it’s the beginning of a process. What do you say to people who see this as applicable only to people who live in urban communities? I say in that letter and I’ll say it now: This is applicable to everyone. First of all, let’s be clear that every community – and I’ll just speak for the city of Baltimore and the nine counties of Maryland that comprise the archdiocese – every community is beset by social problems, by the division of people, by segregation, by racism, by coarse and violent speech. And all of us need to address these problems. … I think Dr. King has offered us a blueprint for coming together in a very divided society in a most constructive, action-oriented way. And that is why I think it applies to every community in the archdiocese. Does this have to include education and action? This is a time for us not simply to be reminded of Dr. King’s great speeches – and they were terrific, they were beautiful, they were so inspiring – not simply to be reminded of the marches and the tragic way he died. If we would really honor Dr. King, we would go to the heart of what he stood for. That’s what this is about – educating ourselves, and when I say educate, I don’t just mean learn about; I mean steep ourselves in this. And steep ourselves such that we get a little introspective and we ask, am I really living up to these principles? … I’m going to want to build bridges. But as a result of building these bridges, I’m going to want to help create a church and a society that’s going to address the root causes of injustice. We’re not imagining we’re going to create a utopia. We are imagining, though, and hoping and praying that we can do a lot better than we’re doing now. Pope Francis said that h se wants the church to go out to the people on the peripheries. You said in your letter that people on the peripheries are not peripheral. How do we get to know real people if they’re not in our particular community of friends? I think that’s what the pope is saying – you can’t really be church if you stay in your comfort zone with only the people you know, only the people who are like you. You’re called to go out to those whose lives are very different from your own and very often to people who are in need. And you don’t go out as the great savior. You go out as an equal. You go out as a sister and a brother. And you go out to someone who has an equal dignity and they share their gifts and you share your gifts. … And that’s why at the end I said you get out to the peripheries and find not they’re not peripheral. … Once they become real people with a real story and with God-given gifts, you know that’s not the case. After reading your pastoral letter, what do you hope people take away from that? Two things: One that I hope that they would do – as I must do myself – which is to take it to prayer, try to take these principles to heart, have that kind of moment of truth individually, in small groups, in parishes and parish communities, in the work place, in their relationships with others. I think it’s a moment of truth for us. And secondly, truth in action, which is then to begin to ask, how can we, how can I … make things different? How ought things be different, and how can we contribute to making them different? You know, some people will be able to contribute a lot to this, some maybe less. But if everybody contributed something, I think we’d move the needle. To join the discussion, click here.